Ya ever notice how predators work? I'm talking spam emails, snail mails, phone calls. They tap into your weaknesses. You need more money? We can help with a mortgage on your house. Or, more likely, we can send you a credit card with an upper limit you can't possibly afford. No credit check and only a 75% interest rate per month. We do accept your first born as payment. You can't perform in bed? We have Viagra, Levitra, Cialis and they're much cheaper than at your local pharmacy. Hell, they're cheaper than aspirin or Ibuprofen. You need love because you're lonely? We have thousands of lovely ladies just waiting for you. And Viagra, Levitra, Cialis are readily available (check your inbox). Hehehe. Afraid you'll burn in hell? We offer salvation. But we would like a small donation to keep the message alive. I'm sure the list is almost endless. I don't know. I don't listen to phone calls trying to push something, throw out the mail I don't recognize and almost never read the spam in my emails. About the picture. 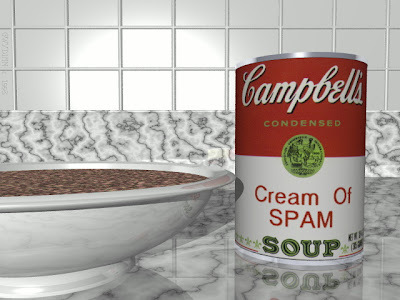 Is that some sort of crème de la crème of SPAM®? Personally, I love SPAM®...not spam. Fried SPAM® sandwiches are great. Especially with an egg. I recommend that you get Gmail and visit your spam folder often. With the way that Gmail provides contextual links, you will often see a link to a (presumably) tasty spam recipe at the top of the page. Dude, I avoid spam by continually changing my profile to show me as being a fourteen year old kid. I don't get squat for spam because it is illegal for companies to spam kids. Eli, I do have Gmail, but almost never check the spam folder. Didn't know what I was missing. Dirkstar, I say I'm over 100. Why do I get spam about erectile dysfunction products? They think I'm still active? Uh, maybe I am still active. Lol.